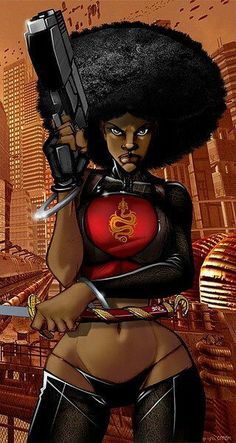 Misty Knight is a Marvel hero known for being a detective and having a cybernetic arm. She is a regular in the Heroes for Hire comic series. 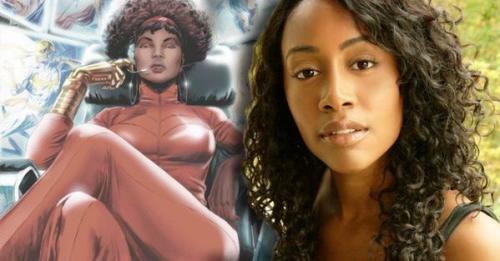 Misty Knight will appear in the Luke Cage Netflix series and be played by Simone Missick. Misty Knight is a police officer with NYPD who is injured in a bomb attack. Her right arm is amputated but she refuses to take a desk job. A meeting with Tony Stark ends with her receiving a fully bionic arm, which gives her superhuman strength. Her first meetings are with Spider-Man, Iron Fist, and for a time she is the roomie of the X-Man Jean Grey. Eventually, she forms a private detective agency with friend Colleen Wing called Nightwing Restorations Inc.
Iron Fist and Misty fall in love after meeting each other. The two have numerous adventures with each other including fighting against Davos the Steel Serpent. The Nightwing Restorations Inc often works closely with Iron Fist and Luke Cage's Heroes For Hire operation. They helped Cage clear his name from crimes committed by the Bushmaster. For a time Misty is involved with a man named Tyrone King. During this time her relationships with Iron Fist and Colleen Wing are heavily strained. However, she ends the relationship and reconciles with Iron Fist. She also at one point dated Power Man/ Luke Cage which strained the relationship of the two Heroes for Hire. Iron Fist is presumed dead for a period ending relationship. During Secret Invasion Misty hunts down a Skrull pretending to be Iron Fist (A good way to make Misty angry). Misty joined the initiative during Civil War after being contacted by Iron Man and Mister Fantastic. She creates a reformed Heroes for Hire that has the task of hunting down unregistered super powered individuals. Iron Fist returns and is shocked that Misty sided with initiative. He joins the New Avengers an Anti-Registration group led by Captain America. Despite, their disagreement, Misty rushes to Danny defense with the 7 cities are threatened by Hydra and the Steel Serpent. After the battle Iron Fist says to Misty, "I love you Misty, but I make a lousy boyfriend". Shortly thereafter the two resume their relationship. Misty Knight captures and trades Moonboy to Paladin in order to save Colleen Wing. Wing is traumatized by the torture and disagrees with Moonboy being used to save her. This breaks up the iteration of Heroes for Hire. Iron Fist and Misty Knight have a series of great surprises. He proposes to her, and she reveals that she is pregnant with his child. However, the pregnancy was a false pregnancy and that puts strain on their relationship. They continue the relationship but live separately. Daredevil takes over the hells Kitchen and a group of heroes including Luke Cage, Iron Fist and Misty Knight move in to confront him. A new Heroes of Hire is born after this event. Misty Knight is part of the Black Panther and Crew group that begins to fight crime in NYC. Heavily trained martial artist with experience that includes training with heavy hitter friends like Iron Fist and Luke Cage. Also has Police, Detective, and Espionage training. Has successfully gone undercover and infiltrated many criminal organizations. Misty Knight will appear in the Luke Cage Netflix series and be played by Simone Missick. Some images of Misty Knight in Luke Cage are coming out. It appears she is a police officer in Harlem. She is the one that tells Luke Cage, "You might be bullet proof but Harlem isn't". She appears to have her arm still so I think the show takes place before receiving her bionic arm. It is possible that Luke Cage will serve as an origin story of sorts for Misty. Misty Knight appear in Defenders where she helps protect the loved ones of the Defenders from the Hand. She comes to the aid of Colleen Wing and she battles Bakuto but loses her arm in the process. At the end of the series she is in a hospital where Colleen tells Misty that she will recieve the best care possible due to Danny's connection in the hospitle. She claries that Danny in effect owns the hospital. Misty Knight will appear with a new cybernetic arm in Luke Cage Season 2. It is unclear if she still will be a member of the NYPD. The arm looks a little more realistic than the arm in the comics. Misty's arm continues to change. Here is an image of her arm in Season 2 of Luke Cage. You can see that it is evolving and becoming more like the high tech arm of her comic counterpart. It looks like Misty may be undercover in one scene and somehow runs into Luke Cage.